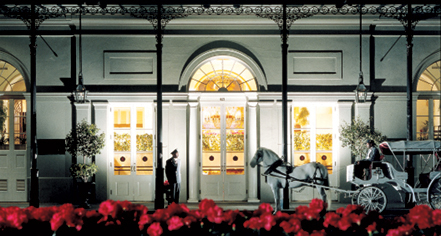 The Omni Royal Orleans is a proud part of history on its legendary site. From the 1830’s onward, this single block of the French Quarter has witnessed all that was and is New Orleans. From creole hedonisa to the austerity of the civil war, reconstruction, a sad decline to the rebirth in the modern world. This grand hotel location has gone by names of the City Exchange, The St. Louis, and The Royal and today its legacy goes by the Omni Royal Orleans. Designed by famed architect, Arthur David, this 346-room hotel opened in October 1960. The Omni Royal Orleans opening on the city’s most fashionable corners became the haunt of the local social elite, famous entertainers and infamous politicians. To this day, it’s known as “the place to see and be seen.” The signature restaurant, “The Rib Room” has been enjoyed by patrons for 50 years. Many notable occurrences such as the idea for Superdome and the Louisiana Jazz and Heritage Festival were developed in the Pipkin Room within the restaurant. This European elegant hotel stands tall to in maintaining a sense of place while preserving the all the enduring touches of suburb hospitality. Omni Royal Orleans, New Orleans, a member of Historic Hotels Worldwide since 2014, dates back to 1843. Gumbo, a think Creole soup, was reportedly invented here. The phrase “There’s no such thing as a free lunch” also purportedly originated with the hotel café’s food deals meant to entice noontime drinkers to keep drinking. Airport Transportation: An airport shuttle may be arranged through the hotel's concierge, rates apply. Approximately $24 one way per person; $44 round-trip (advance purchase required). Deposit: $50 per night deposit is required at time of booking. Hotel/Resort Fees & Taxes: All reservations may be subject to a City/State Tax of 14.75% plus $2.00 per night. Parking: Valet parking: Available; $47.57 per night (in/out privileges). Pet Policy: Restrictions: Dogs and Cats Only. Maximum weight: 25lbs. Maximum amount: 1 pet per room (more if preapproved). Fees: $50 (nonrefundable cleaning per stay per room). Other: Extreme or wild animals are not authorized. Service animals for blind or otherwise disabled are exempt from fee and weight limit. Rollaways: Available upon request; $30 per night. Shuttle Service: An airport shuttle may be arranged through the hotel's concierge, rates apply. Approximately $24 one way per person; $44 round-trip (advance purchase required). Smoking Policy: Guests are allowed to smoke on the balconies of their rooms if it does NOT bother other guests. It is up to the hotel’s discretion on the amount a guest will be charged for smoking in guest rooms or other non-smoking areas of property. Transportation: Limo or town car service may be available. 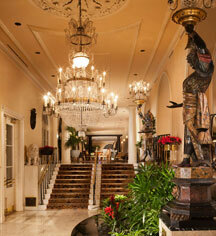 The Omni Royal Orleans is a proud part of history on its legendary site. From the 1830’s onward, this single block of the French Quarter has witnessed all that was and is New Orleans. From creole hedonisa to the austerity of the civil war, reconstruction, a sad decline to the rebirth in the modern world. Learn more about the History of Omni Royal Orleans, New Orleans .